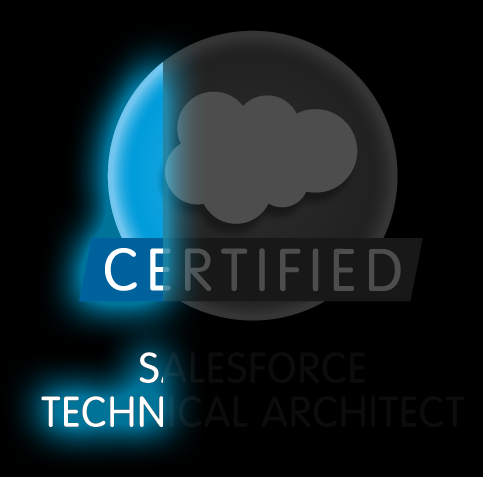 It’s been on my “to-do” list for some time… and today I’m happy to say I passed the Salesforce Certified Technical Architect Multiple-Choice Exam! Of course I still have the infamous review board presentation, but I thought I would share my experience thus far. After working on the platform since 2009 and taking the other 6 exams, this one really wasn’t too bad for me. But just to be safe, I took the process very seriously. After all, it is $500 with a $250 retake fee! Architecting a wide variety of creative solutions across all the clouds. Years of heads-down development work. Multi-tenant and large data related issues, such as query optimization. To review I watched the salesforce video training available through the partner community help and training on topics like Integration, Multi-Org strategies, Governance, and SSO / OAuth. Any topics I wanted to study and couldn’t find videos for I just searched in the help documentation and found exactly what I wanted. Make sure you know what all these words mean, and all the ways to use them! Understand all the relevant types of compliance standards (SAS, ISO, PCI, etc). Don’t be shy about using the scratch paper they give you. You may have to calculate governor limits, sketch a rough ERD or flow chart, or use process of elimination by crossing things out. I used 100 of the 120 minutes they gave me to complete the 60 questions. I just proceeded at a moderate and steady pace through the whole test without revisiting any of my answers. This strategy worked great this time, but on past exams I skipped questions I was unsure of and revisited them later. Once you have the rhythm of the test figured out, you aren’t as stressed about running out of time, and re-visiting seems unnecessary. There were some things in the study guide which weren’t on the exam, but if the exam questions are random, then perhaps someone else would those questions the next time. 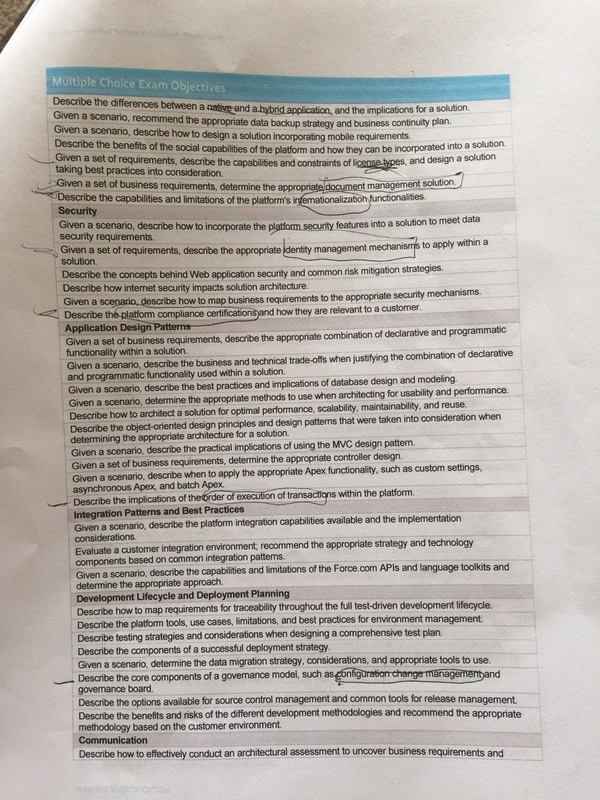 Overall, I thought the study guide was a perfect tool for directing my study efforts. If you have a true force.com understanding of 70% on the breadth and 60% of the depth you can probably pass this test with minimal study. But the more you can study the better! Cutting it close is stressful, and you never know what random questions you may get or any mistakes you might make. Learn everything the right way over the years and it will sink in and most of the questions will feel like “freebies”!